I love the start of a new school year and time to regroup, set new goals, and celebrate the little moments! As a public school teacher the month of August was always really stressful for me as I got my classroom ready for the start of school. As a mom I have a lot of thinking time during August since we are usually road tripping. I like to use that time to think of fun ways to kick off the new school year and cool new traditions to start. A few years ago we did a birthday book breakfast for my oldest when he turned three. He loved it! This year I decided to combine a simple superhero theme with some favorite (and new-to-us) back to school books and kick off the school year with a SUPER Back to School Breakfast. I think this will be a new tradition. We all really loved it and it didn't take very much time to pull together. As you can see, we keep breakfast really simple on crazy busy days. Usually I like to add in something a bit more substantial, like eggs, but since the kids only had half day on their first day and we had to leave early, this is all we had time for. We found all of our simple decor in the Target party aisle or dollar spot aisle. My kids were especially excited about the cardboard alphabet puzzles, chalkboard clipboards, and crayon bath soaps that I found in the dollar spot. I also grabbed some pencils since we will need a lot of them in the coming weeks. 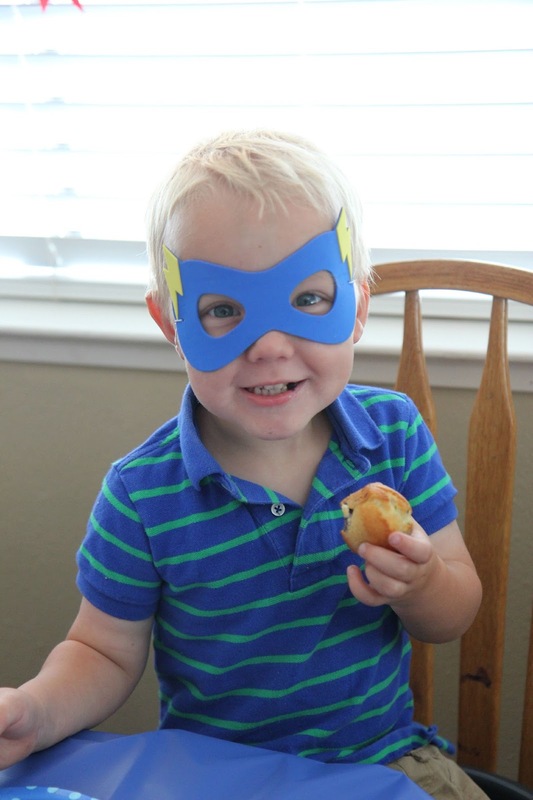 The kids were IN LOVE with the super hero masks I found. I also made some silly printable signs. 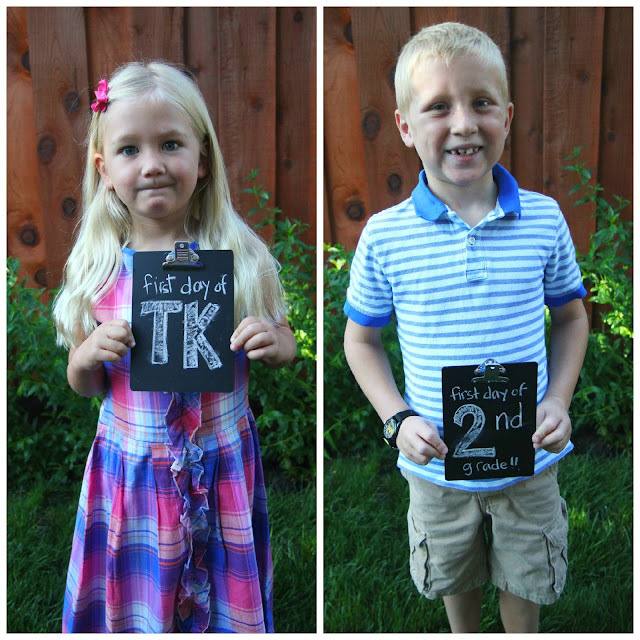 The kids thought they were funny and were excited to start the year off with a BANG! The best part of the morning was that we woke up early enough to enjoy time together eating breakfast without feeling rushed. This required some sacrifice on my part since I absolutely hate waking up before 7am (yes I know I am spoiled). 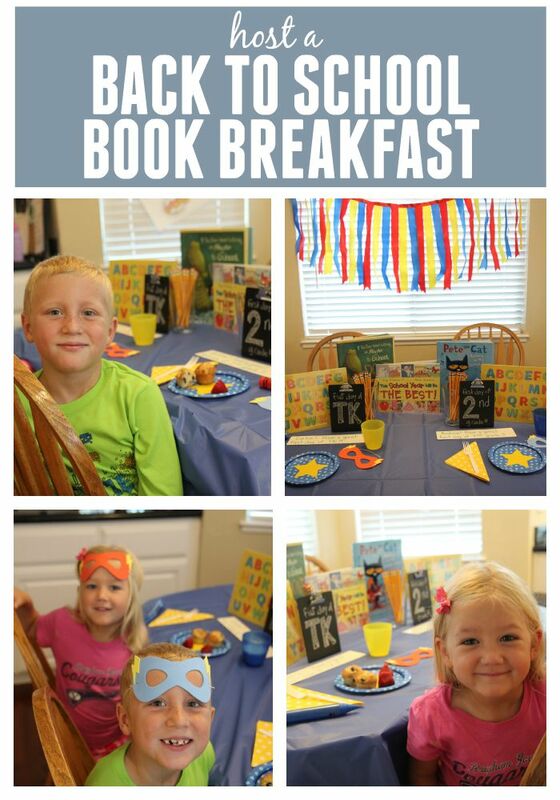 My toddler actually slept through the entire book breakfast except for the last story. He was up a lot the night before with nightmares so we just let him sleep him! We ended the book breakfast with our traditional back to school photos outside before we went to school! Do you have any favorite Back to School traditions that you love (and do again and again) or that you want to start? 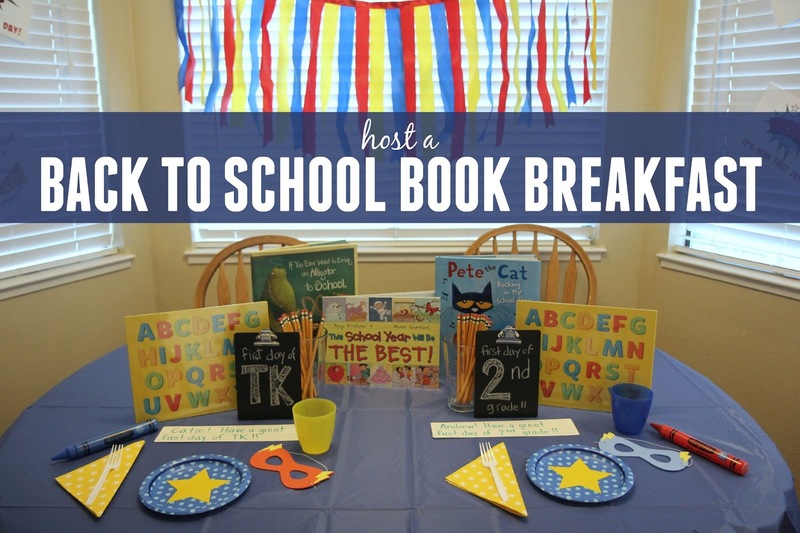 Do you have any other favorite Back to School books that you like to read? Wemberly Worried by Kevin Henkes and The Kissing Hand by Audrey Penn. Both are good for starting conversations with little ones who might have the first day of school jitters. If you have a child who is anxious about the start of school you may also enjoy our Helping Kids with Anxiety in Preschool post. What a fun way to kick off the school year! That is ADORABLE! I saw another mom had done a Teenage Mutant Ninja Turtles first day and it looked fantastic, too. What to do, what to do??! !